Reckless Driving! On Friday, 3 November, a heavy motor vehicle came to a standstill on top of the wheels of another truck in an accident on the Pongola Road. At about 12:30, three trucks were driving behind each other, towards Pongola. A Volkswagen Polo attempted to overtake all three trucks at once. The driver of the Polo noticed an oncoming vehicle when two trucks had been passed. He then pushed in between the first and the second truck to try and avoid a head-on collision. The driver of the second truck braked to avoid a collision with the Polo. The driver of the third truck was driving too close and could not brake quick enough. The driver of the second truck moved off the road to give the driver of the third truck a longer space to brake. However, a collision could not be avoided. The third truck hit the second one on its side and moved up the second truck and damaged its diesel tank. No injuries were sustained in the accident. The driver of the Polo drove away uninjured from the scene. Personnel from the Emergency Services would like to thank Mr Heinz from the Roads Department for the cement that was used to clean up the diesel on the scene. 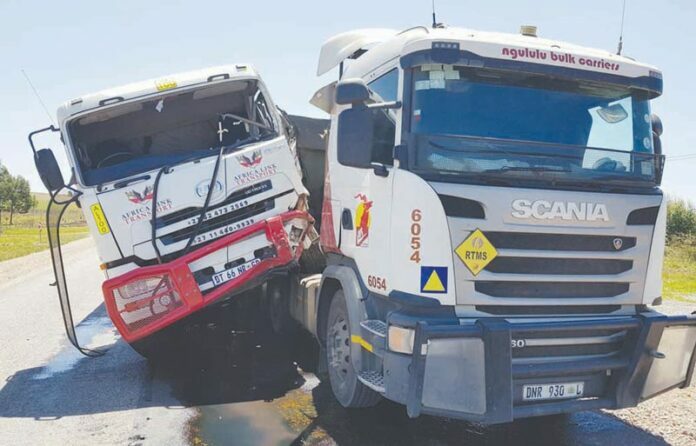 Motorists will tell you that trucks on the roads are a cause of frustration, especially when two or more trucks drive behind each other without leaving a reasonable gap in between one another for motorists to pass them safely. Watch the vehicle in front of you pass a landmark – such as a sign, tree, or power pole – at the side of the road. As it passes the landmark, start counting “one thousand and one, one thousand and two, one thousand and three”. If you pass the landmark before you finish saying all these words, you are following too closely. Slow down, pick another landmark and repeat the words, to make sure you have increased your following distance. Owners of trucks are requested to inform their driver to maintain, not only a safe following distance behind other trucks, but to ensure that there is enough space between the other truck and themselves to allow motorists to safely overtake them, one truck at a time. We can only make the roads safer for everyone, if we all work together and do our part.